The Bahamas, which gained independence from the U.K. in 1973, is an archipelago comprising some 700 islands (of which maybe 30 are inhabited) and more than 2,000 cays, all scattered across the ocean. They stretch from Grand Bahama Island -- about 75 miles east of Palm Beach, Florida -- to Great Inagua -- about 60 miles to the northeast of Cuba. The geography can be confusing -- the Bahamas is in the Atlantic but dips its toes in the Caribbean. The population is mostly of African descent, and nearly 60 percent live on New Providence Island. 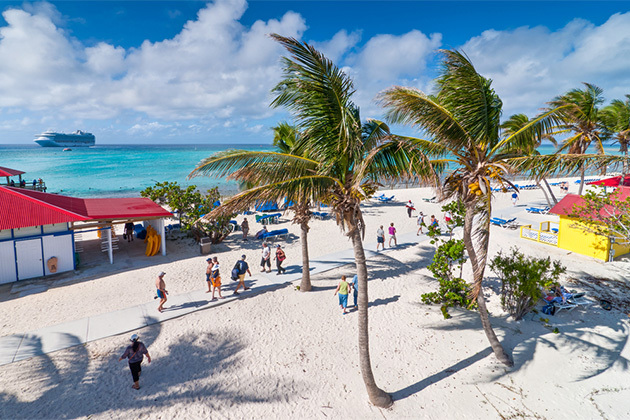 Generally, cruisers touch terra firma here to visit candy-pink Nassau, Cable Beach and Paradise Island, or ships head to the lush, green Grand Bahama Island, for spending time in Freeport and Lucaya. Both have activities to keep you going day or night -- be it sand-lounging along coastline beaches, hiking through national parks, shopping island markets or fancy boutiques, dancing the limbo in Count Basie Square, teeing off, glitzy casino gambling -- or filling up on fresh conch. Nassau is the capital of the Bahamas and is the center of all the islands' industry, commerce and communications. It has one of the largest straw markets (but no casinos) in all the Caribbean. 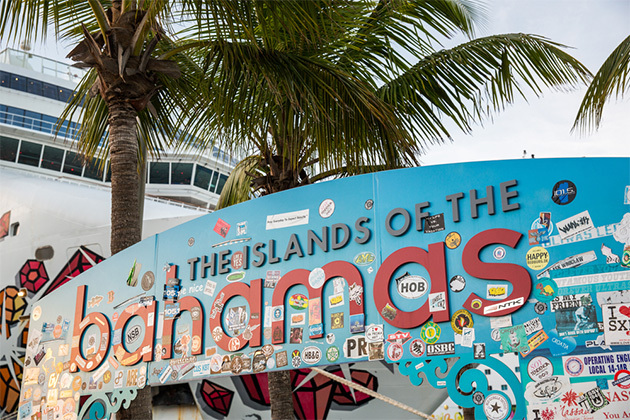 Freeport is the Bahamas' fourth-largest island and is second only to Nassau in popularity (here's where to find the casinos). It began to enjoy popularity in the 1950's as a veritable "man-made" Vegas-type island that happens to be surrounded by turquoise waters speckled perfectly with marvelous beaches instead of a barren desert. Mere miles to the west is Lucaya, another "man-made" paradise that grew up in the 1960's. For those into nature, Grand Bahama is also home to one of the oldest underwater cave systems in the world, situated at the Lucayan National Park. For history buffs, the Victorian buildings and fortresses of Nassau should do the trick. For extreme sporters, there's everything from parasailing to jet-skiing and diving through underwater caves at the two popular stops. Low season, schmo season! Truth is, the tropical maritime temps here rarely budge more than a few notches from 80 degrees, and the sun shines more than 300 days a year. The rainy season is May through October, but rain is generally fleeting. The hurricane season picks up in August and can last through November. 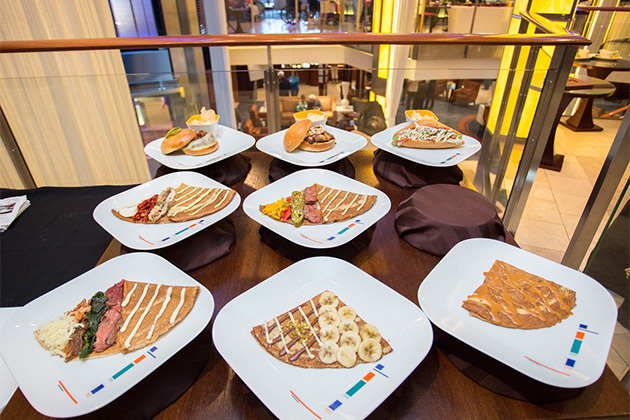 Mostly mainstream lines -- Carnival, Disney, Norwegian Cruise Line and Royal Caribbean -- offer Bahamas cruises; premium line Celebrity does, as well. Most cruises begin on the Eastern Seaboard or Gulf Coast -- offering affordable voyages, typically ranging from three to seven nights. 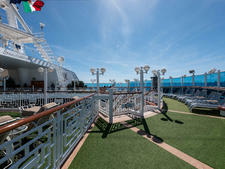 Many lines will tack on a stop in the Bahamas, even if just at a private island, on a regular Caribbean cruise. 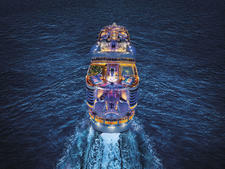 Overnights: Celebration Cruise Line offers two-nighters year-round, from West Palm Beach to Freeport and back. The Bahamas is its only destination. 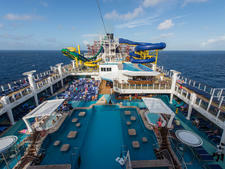 Every year, a handful of major cruise lines offer a few two-night cruises as well. Short-hop Trips: The three- to five-night varieties typically depart from Miami, Port Canaveral and Fort Lauderdale's Port Everglades. Carnival offers some alternative homeports, as well. 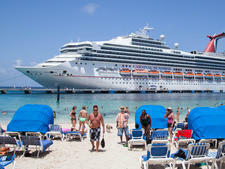 The short cruises usually visit some combination of Nassau, Freeport, Key West and/or the cruise line's private island. Weeklong Cruises: Seven- and eight-night cruises leave from New York, Bayonne (Cape Liberty), Baltimore, Galveston and New Orleans and call on the Bahamas and Florida. The Florida stops are usually Port Canaveral or Key West. Freeport/Lucaya. 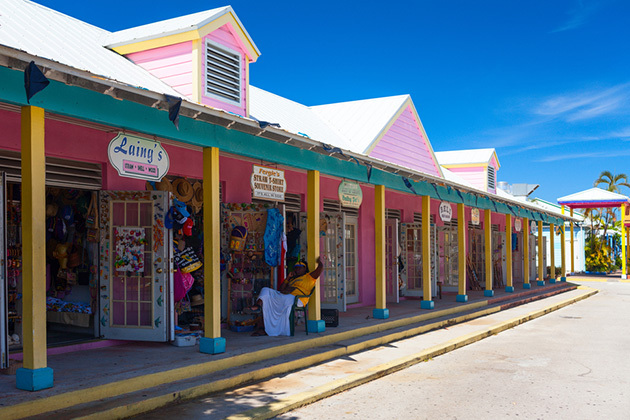 Port Lucaya Marketplace offers tourists shopping at more than 70 boutiques as well as a handful of restaurants. There's the Isle of Capri Casino for gambling and the Lucayan and Reef courses for golfing. The beaches here are marvelous and offer all the key services from Jet Ski rentals to oceanfront bars. Active types can snorkel and scuba dive at Paradise Cove at Deadman's Reef, horseback ride on the beach, or hike, kayak and cycle in Lucayan National Park. Nassau/Paradise Island. The Straw Market is a Nassau tradition, and you'll find all sorts of touristic souvenirs on sale, from thatched purses to hair-braiding. 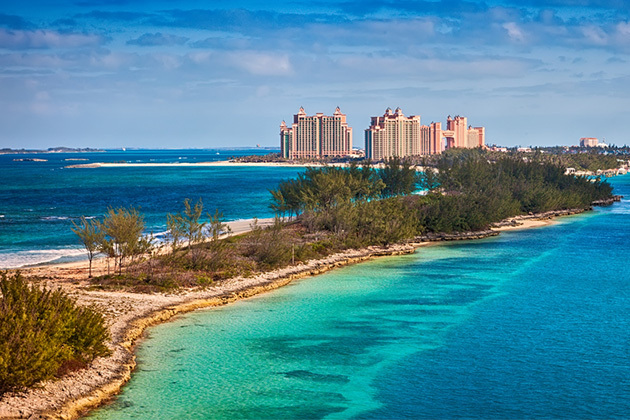 A day pass to the Atlantis Resort on Paradise Island gets you access to most of the must-see sights at the resort, such as the Dig, the marine habitats and their beach. Or head to Blue Lagoon Island to make friends with dolphins. For culture, visit the 18th-century Fort Charlotte and roam the dungeons and underground passageways and see the waterless moat. Just don't forget to check out the amazing views of the harbor from the ramparts. Or hit the beach for sunbathing and water sports. Private Islands. 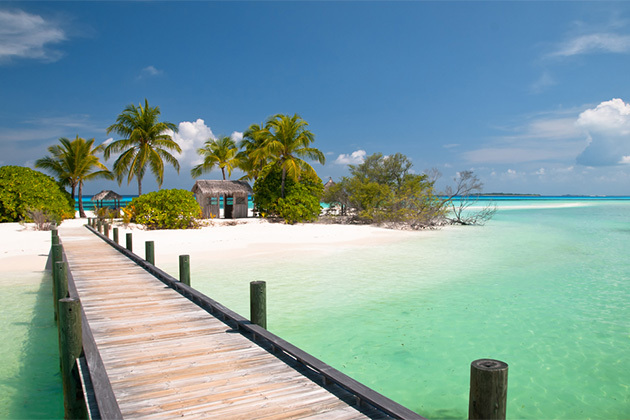 Private islands in the Bahamas include Castaway Cay (Disney), CocoCay (Royal Caribbean), Great Stirrup Cay (Norwegian), Half Moon Cay (Carnival and Holland America) and Princess Cays (Princess). Each is unique, but in general, private islands offer beaches for swimming and sunbathing, often with private cabana rentals; water sports and water play areas; free buffets set up by the ship's dining staff; bars where beer and tropical drinks are for sale; shops; and shore excursions like horseback rides or parasailing. Abaco. Take a stroll through the tiny Hope Town to see the candy-cane striped lighthouse. Built in 1864, it's one of the last three hand-wound kerosene-burning lighthouses in the world. Feed the stingrays off Green Turtle Cay. Bimini. For those who dare, dive from 70 feet into the Gulf Stream at the Bimini Wall. Eleuthera. Take a 10-minute water taxi to see Harbour Island (a.k.a. Briland) and Dunmore Town's 200-year-old architecture -- a cluster of New England-style clapboard houses framed by picket fences and fragrant, colorful blooms. Guzzle down a Goombay Smash (pineapple, coconut, light and dark rum, pineapple juice, lime and a touch of grenadine and bitters) while watching the sun set along the harbor. Pack for your intended activities. If you're heading to the beach, pack casual clothing, bathing suits and plenty of sunscreen. If you're in need of a culture fix, pack comfortable shoes for walking around forts and lighthouses. Golf junkies, bring your clubs for hitting the links. Be safe. Crime has been on the rise in the Bahamas, especially on New Providence Island. The U.S. Embassy has had reports of robberies and muggings, as well as sexual assaults. Be aware of your surroundings, leave valuables onboard and don't travel alone, especially at night or away from populated areas. Learn more about staying safe in port.